William was a veteran of the New York Militia and had been severely wounded in the first major battle of the War of 1812 at Queenston Heights. His injuries left him permanently disabled in some regard and prevented him from earning a living through his only means of income, which was manual labor. We can verify all of this through William's pension record. 1850 Platt Family CensusAfter marriage, probably in late 1843 or early 1844, Melzer and Harriet move to Pulaski, Lawrence, Pennsylvania (still along the OH-PA border) where we find them on the 1850 census.16 I believe this time frame because an old (sadly unsourced) family tree notes that Sarah C. Bryant marries her husband Rufus Dodge in Sharon, Mercer, Pennsylvania on 11 Jun 1844. What's most telling about this note is that the center of town for Sharon is only 10 miles north of Pulaski. 1860 Platt Family CensusAround 1853-1854, daughter Helen Augusta marries William S. Wallace, probably in Pulaski or Sharon, Pennsylvania as well (again based on inability to trace records), and the couple moves to North Ridgeville, Lorain, Ohio by 1855 when their first child is born.20 In total, they raise a family of 3 sons and 4 daughters. Harriet Platt died in Elyria, Lorain, Ohio on 13 Mar 1876 at the age of 74 years, 1 month, 7 days.1 I believe since she died in Elyria, that she died under the care of daughter Helen Wallace who had moved to Elyria with her family between the 1870 and 1880 censuses. Harriet Platt Death Record (1876)At this point you might be saying, You just weaved this lovely story of the daughters of Harriet Bryant, but you haven't made any mention of son Benjamin Franklin Bryant and you said he is related to the family! Well... you're right. I haven't made any direct mention of Benjamin, because there is no direct evidence (that I have found). Benjamin left home early and neither he, nor his family, ever left a census record or any obvious clues of his relation, not even in an obituary or death record... but his daughter did, and so did his niece! 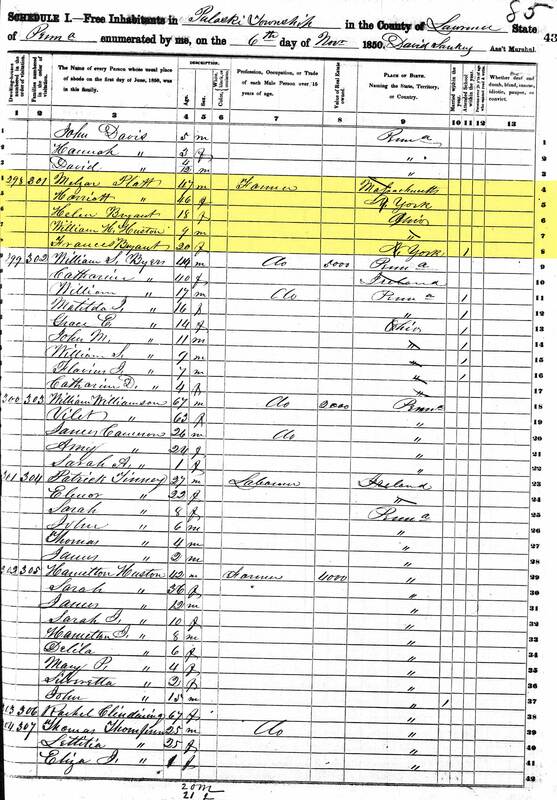 Helen Lorina Bryant was born 14 April 184731 in what conflicting records believed to be Madison, Lake, Ohio (1850 census says OH, death record incorrectly says NY) to parents Benjamin Franklin Bryant and Elizabeth Gilbreath. Finally, Benjamin Franklin Bryant was a stage coach driver (a rare profession). The same can be said for Sarah Bryant's husband Rufus Dodge. It's possible that either he and Benjamin were drivers together and he introduced Rufus to his sister Sarah or, the more likely scenario based on census records, Rufus and Sarah married and sometime later Benjamin convinced Rufus it was a good line of work to get into or when times got hard, Benjamin provided some guidance that Rufus could fall back on and he took up the occupation. Harriet M. Bryant, 1823 – ? A There are two additional unknown sons of William Bryant and Harriet Harris. 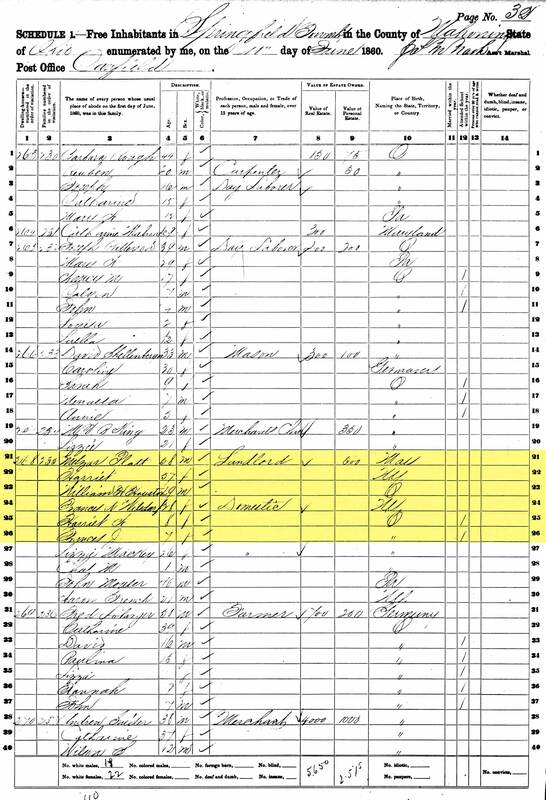 On the 1840 census, it's stated that Harriet was housing a man in his 20's and a second unknown son somewhere between the ages of 15-19 in addition to Frank. It's likely these boys were 19 & 21 years old, born about 1820 & 1818 respectively. B Portrait of Harriet Harris is courtesy William King, descendant of Harriet's daughter, Jane Elizabeth Bryant. The photograph is labeled "Great Grandmother Platt". Photo was likely taken at a studio in Elyria, where similar photos of Harriet's grandchildren were taken (who were living in the neighboring houses). C William H. Husted was the son of daughter Harriet M. Bryant but raised by Harriet & second husband Melzar after it appears daughter Harriet and her husband die... it's pure speculation, but also a possibly that daughter Harriet remarried and her new husband refused to accept a son that wasn't his into the family, however I've found no records prove any of this (not even daughter Harriet's death). D An obituary for Helen Bryant-Wallace's son Lewis from 16 Feb 1893 in page 5 of the Elyria Weekly Republican mentions in attendance "Uncle Frank Judkins, and family, of Cleveland" confirming the family relations and marriages I've slowly pieced together are accurate. 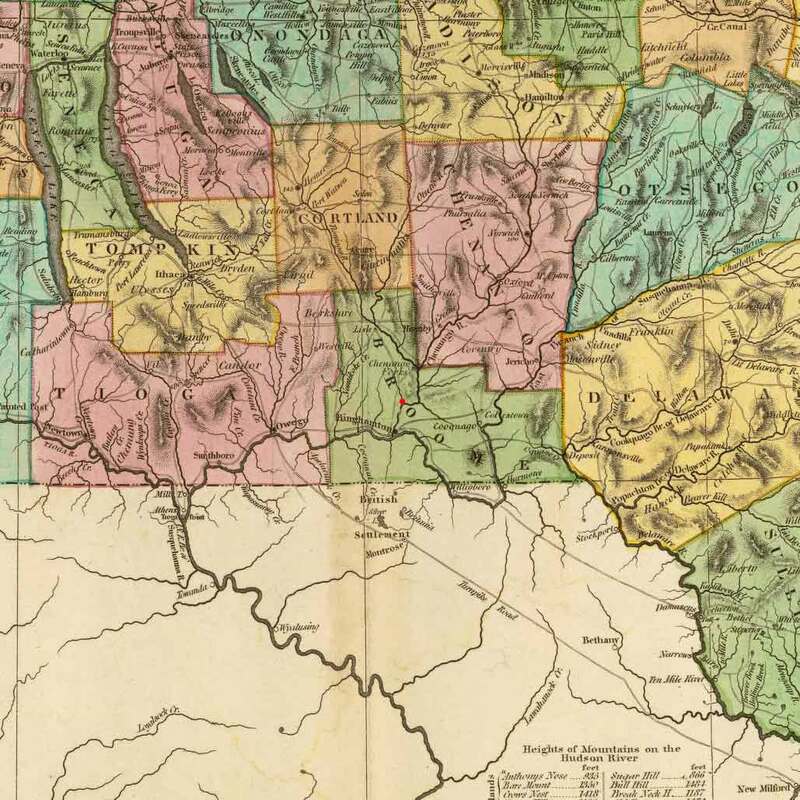 E It should be noted that Mahoning County did not exist until 1846 when it was formed from Trumbull & Columbiana Counties (so any records prior to 1846 would not be in Mahoning). 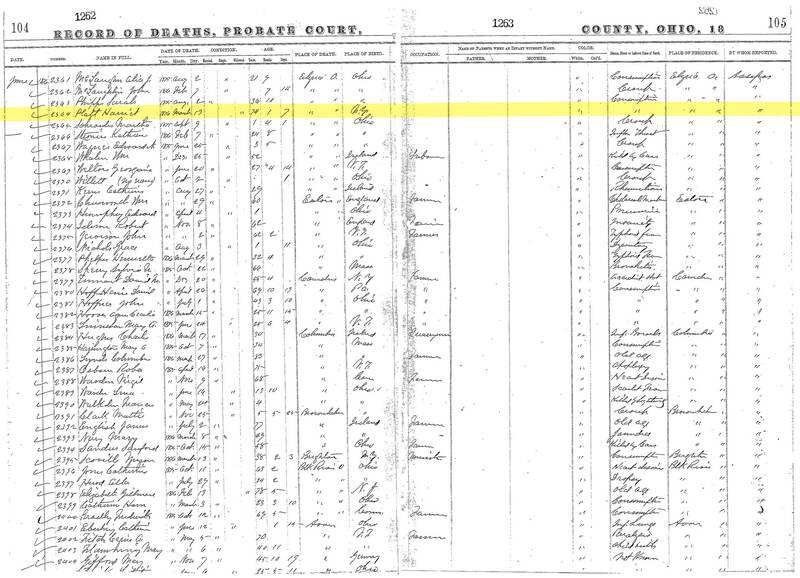 1 Ohio Record of Deaths for Harriet Platt, 1876; Record of Deaths, Probate Court, Lorain County, Ohio; Lorain County Records Retention Center (http://www.lcrecordscenter.com/records-search/birth_death_records.shtml); Accessed: 2 Feb 2014; Death Records 1867-1889; Year: 1876; Name: Platt, Harriet; Stamped No. :1262; pg. 104-105; Entry No. : 2364. 2 Gravestone of Harriet Platt, 1802-1876; Ridgeville Center Cemetery; North Ridgeville, Lorain County, Ohio; Name: Harriet Harris; Location: West End, under tree half way back. 3 Obituary for B. F. Bryant from Painesville, Ohio Newspaper; Painesville, Lake County, Ohio; Thursday, 3 Nov 1904; Painesville Newspaper Unknown; Title: Veteran Stage Driver Dead. 4 Harriet M. Bryant, "Ohio, County Marriages, 1789-1994"; "Ohio, County Marriages, 1789-1994," index and images, FamilySearch (https://familysearch.org/pal:/MM9.1.1/X8JK-ZPB : accessed 02 Feb 2014), Comfort Husted and Harriet M. Bryant, 25 Sep 1840; citing Trumbull, Ohio, United States, reference 1839-1842 p 103; FHL microfilm 904255. 5 Family Bible Record of Jane Elizabeth Smith, 1863; Smith Family Bible Records; Parents Page; Record property of William King (billking2011@live.com), descendant of Jane Bryant. 6 Family Date Book Record of Sarah Bryant Dodge; Frances Jane Dodge's Family Date Book; Page 18; Among personal affects of Kathryn Lowe (Sarah's Granddaughter) under care of Eric Lowe. 7 Family Date Book Record of Frances Amelia Bryant; Frances Jane Dodge's Family Date Book; Page 18; Among personal affects of Kathryn Lowe (Sarah's Granddaughter) under care of Eric Lowe. 8 Ohio, Find A Grave Index, 1682-2012 about Hellen A. Wallace; Find A Grave. Find A Grave; (http://www.findagrave.com/cgi-bin/fg.cgi?page=gr&GRid=64200214); accessed 31 January 2014; See headstone inscription for date of birth; Memorial No. : 64200214. 9 Charles H. Wallace, "Illinois Deaths and Stillbirths, 1916-1947"; "Illinois Deaths and Stillbirths, 1916-1947," index, FamilySearch; (https://familysearch.org/pal:/MM9.1.1/N3W9-3BG : accessed 03 Feb 2014), Charles H. Wallace, 24 Aug 1947. 10 1840 United States Federal Census about Hariet Briant; Year: 1840; Census Place: Warren, Trumbull, Ohio; Roll: 429; Page: 44; Image: 104; Family History Library Film: 0020178. 11 Harriet Bryant, "Ohio, County Marriages, 1789-1994"; "Ohio, County Marriages, 1789-1994," index and images, FamilySearch (https://familysearch.org/pal:/MM9.1.1/XZYT-4BZ : accessed 03 Feb 2014), Comfert Housten and Harriet Bryant, 31 Dec 1840; citing Trumbull, Ohio, United States, reference v 200; FHL microfilm 904260. 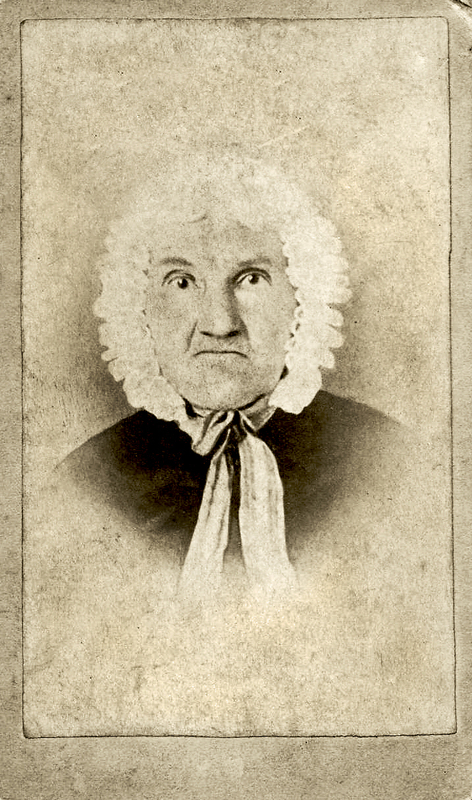 12 Harriet Husted, "Ohio, County Marriages, 1789-1994"; "Ohio, County Marriages, 1789-1994," index and images, FamilySearch (https://familysearch.org/pal:/MM9.1.1/X8J2-6MX : accessed 03 Feb 2014), William Fowler and Harriet Husted, 18 Apr 1844; citing Trumbull, Ohio, United States, reference 1842-44 p 202; FHL microfilm 904255. 13 Richard Worth Smith, "Ohio, County Marriages, 1789-1994"; "Ohio, County Marriages, 1789-1994," index and images, FamilySearch (https://familysearch.org/pal:/MM9.1.1/XDLW-7YC : accessed 03 Feb 2014), Richard Worth Smith and Harriet Ann Fowler, 24 Aug 1852; citing Trumbull, Ohio, United States, reference P. 117; FHL microfilm 905549. 14 Harriet Bryant, "Ohio, County Marriages, 1789-1994"; "Ohio, County Marriages, 1789-1994," index and images, FamilySearch (https://familysearch.org/pal:/MM9.1.1/X8J2-SZV : accessed 03 Feb 2014), Melso Platt and Harriet Bryant, 31 Jan 1843; citing Trumbull, Ohio, United States, reference 1842-44 p 81; FHL microfilm 904255. 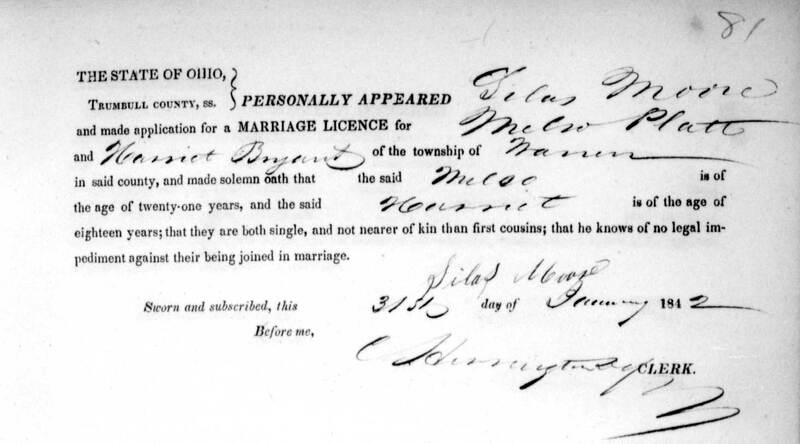 15 Harriet Bryant, "Ohio, County Marriages, 1789-1994"; "Ohio, County Marriages, 1789-1994," index and images, FamilySearch (https://familysearch.org/pal:/MM9.1.1/XD72-P2P : accessed 03 Feb 2014), Mils Platt and Harriet Bryant, 04 Feb 1843; citing Ashtabula, Ohio, United States, reference P 33; FHL microfilm 890264. 16 1850 United States Federal Census about Melzar Platt Family; Year: 1850; Census Place: Pulaski, Lawrence, Pennsylvania; Roll: M432_790; Page: 43A; Image: 91. 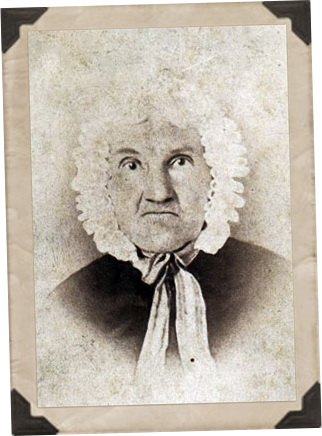 17 Jane Bryant, "Ohio, County Marriages, 1789-1994"; "Ohio, County Marriages, 1789-1994," index and images, FamilySearch (https://familysearch.org/pal:/MM9.1.1/XZYY-WH9 : accessed 03 Feb 2014), Sydney J. Smith and Jane Bryant, 10 Jul 1847; citing Trumbull, Ohio, United States, reference p-266; FHL microfilm 904261. 18 1850 United States Federal Census about Jane Smith; Year: 1850; Census Place: Elyria, Lorain, Ohio; Roll: M432_705; Page: 514A; Image: 542. 19 Portrait of Harriet Platt; Smith Family Records Collection; Photograph inscribed Great Grandmother Platte; Record property of William King (billking2011@live.com), descendant of Jane Bryant. 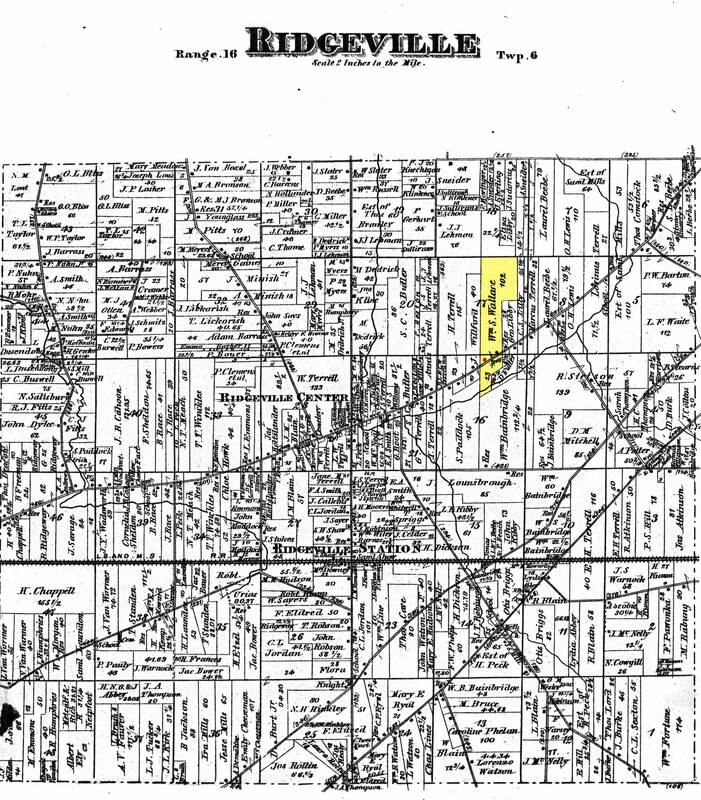 20 James E Wallace, "Ohio, Deaths, 1908-1953"; "Ohio, Deaths, 1908-1953," index and images, FamilySearch (https://familysearch.org/pal:/MM9.1.1/X6S9-FW1 : accessed 03 Feb 2014), James E Wallace, 18 Mar 1925; citing Cleveland, Cuyahoga, Ohio, reference fn 13861; FHL microfilm 1992616. 21 Contracts Awarded by Postmaster Genearl, Melzer Platt, 1857; Offers and contracts for carrying the mails. Letter from the Postmaster General, transmitting an abstract of offers and contracts for carrying the mails. February 26, 1857. -- Laid on the table and ordered to be printed. Date: Thursday, February 26, 1857 Publication: Serial Set Vol. No.907; Report: H.Exec.Doc. 83. 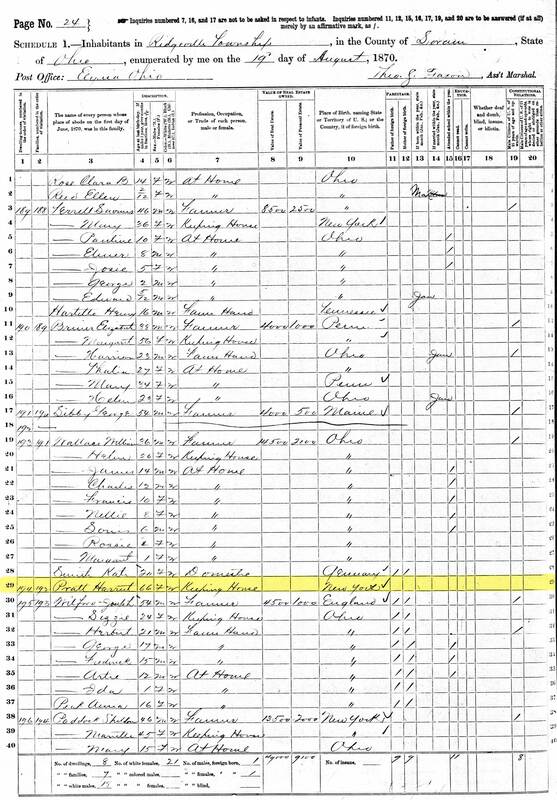 22 1860 United States Federal Census about Harriet Platt; Year: 1860; Census Place: Springfield, Mahoning, Ohio; Roll: M653_1005; Page: 162; Image: 328; Family History Library Film: 805005. 23 1860 United States Federal Census about Sarah C Dodge; Year: 1860; Census Place: Springfield, Mahoning, Ohio; Roll: M653_1005; Page: 163; Image: 330; Family History Library Film: 805005. 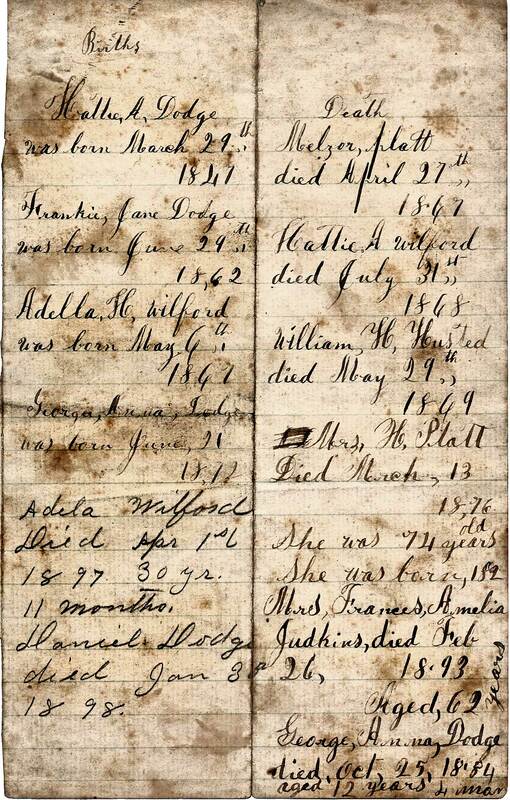 24 Family Bible Records about Melzar Platt; Family Bible Records of Dodge-Bryant Family; Loose paper citing various family births and death; Among personal affects of Kathryn Lowe (Sarah's Granddaughter) under care of Eric Lowe. 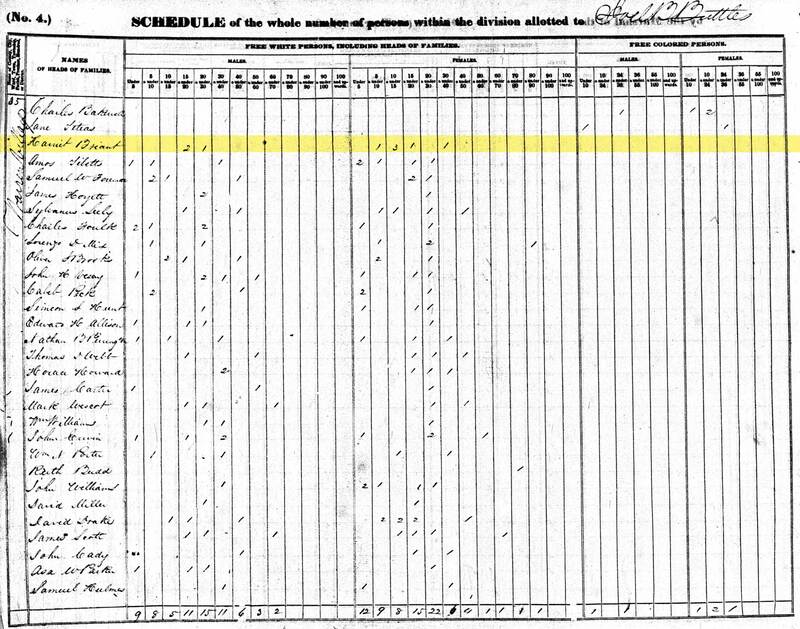 25 1870 United States Federal Census about Harriet Pratt; Year: 1870; Census Place: Ridgeville, Lorain, Ohio; Roll: M593_1235; Page: 594B; Image: 580; Family History Library Film: 552734. 26 Fanny A. Wilsdorf, "Ohio, County Marriages, 1789-1994"; "Ohio, County Marriages, 1789-1994," index and images, FamilySearch (https://familysearch.org/pal:/MM9.1.1/X8SV-W4K : accessed 03 Feb 2014), Frank Judkins and Fanny A. Wilsdorf, 30 May 1868; citing Lorain, Ohio, United States, reference ; FHL microfilm 447524. 27 A Pair of Unsourced Newspaper Clippings on Sarah Bryant-Dodge’s Death; Among misc Dodge-Bryant family records; Part of a box of Kathryn Lowe’s family files & photos currently in my possession. 28 Obituary for Francis Amelia Judkins; The Cleveland Plain Dealer; Cleveland, Cuyahoga, Ohio; Monday, 27 February 1893; pg. 2, Judkins, Francis Amelia. 29 Death of Helen Wallace; Elyria Chronicle Newspaper; Elyria, Lorain, Ohio; Thursday, 10 September 1903; Title: Mrs. Helen Wallace Dead. 30 Family Bible Records about Bryant Family Members; Family Bible Records of Dodge-Bryant Family; Loose paper citing various family births and death; Among personal affects of Kathryn Lowe (Sarah's Granddaughter) under care of Eric Lowe. 31 Family Date Book Record of Helen Lorina Bryant; Frances Jane Dodge's Family Date Book; Page 19; 14 Apr 1847; Among personal affects of Kathryn Lowe (Sarah's Granddaughter) under care of Eric Lowe. 32 Helen L. Bryant, "Ohio, County Marriages, 1789-1994"; "Ohio, County Marriages, 1789-1994," index and images, FamilySearch (https://familysearch.org/pal:/MM9.1.1/XZX2-WYR : accessed 03 Feb 2014), William Henry Harrison Bryner and Helen L. Bryant, 25 Dec 1869; citing Lake, Ohio, United States, reference 64; FHL microfilm 974916. 33 1870 United States Federal Census about Helen Briner; Year: 1870; Census Place: Ridgeville, Lorain, Ohio; Roll: M593_1235; Page: 594B; Image: 580; Family History Library Film: 552734. 34 W.H. Bryner, "Ohio, Deaths and Burials, 1854-1997"; "Ohio, Deaths and Burials, 1854-1997," index, FamilySearch (https://familysearch.org/pal:/MM9.1.1/F6ZR-JZZ : accessed 03 Feb 2014), W.H. Bryner, 23 Nov 1879. 35 Family Date Book Record of Mary E. Bryner; Frances Jane Dodge's Family Date Book; Page 19; 23 Oct 1879; Among personal affects of Kathryn Lowe (Sarah's Granddaughter) under care of Eric Lowe. 36 Helen Bryner, "United States Census, 1880"; "United States Census, 1880," index and images, FamilySearch (https://familysearch.org/pal:/MM9.1.1/M89X-6X5 : accessed 03 Feb 2014), Helen Bryner, Painesville, Lake, Ohio, United States; citing sheet 413A, family 0, NARA microfilm publication T9-1038. 37 Helen Bryner, "Ohio, County Marriages, 1789-1994"; "Ohio, County Marriages, 1789-1994," index and images, FamilySearch (https://familysearch.org/pal:/MM9.1.1/XD28-D48 : accessed 03 Feb 2014), Patrick Burns and Helen Bryner Or Byrner, 28 Jun 1893; citing Lake, Ohio, United States, reference mrI pg460; FHL microfilm 974918. 38 Mary E. Bryner, "Ohio, County Marriages, 1789-1994"; "Ohio, County Marriages, 1789-1994," index and images, FamilySearch (https://familysearch.org/pal:/MM9.1.1/XD2Z-YL3 : accessed 03 Feb 2014), Willard H. Morse and Mary E. Bryner, 01 Jan 1901; citing Lake, Ohio, United States, reference bk12 pg193; FHL microfilm 974920. 39 1910 United States Federal Census about Helen Burns; Year: 1910; Census Place: Cleveland Ward 19, Cuyahoga, Ohio; Roll: T624_1173; Page: 4B; Enumeration District: 0290; FHL microfilm: 1375186.